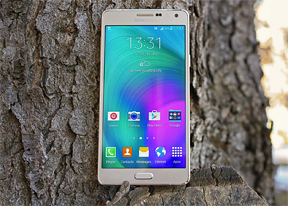 The Samsung Galaxy A7 comes with either a Snapdragon 615 chipset or an Exynos 5430. Both feature octa-core big.LITTLE processors, 4x Cortex-A15 and 4x Cortex-A7, but the Exynos uses higher clock speeds - 1.8GHz and 1.3GHz versus 1.5GHz and 1GHz. This is partly due to a manufacturing advantage, Samsung's 5430 chipset is built on 20nm while Qualcomm's 615 is on a 28nm process. The GPUs are also different, an Adreno 405 for the Snapdragon and Mali-T628 MP6 for the Exynos. Both versions come with 2GB of RAM and currently run Android 4.4.4 KitKat. We only have the Snapdragon 615 version to test, but the Samsung Galaxy Alpha uses the Exynos 5430 chipset and ran KitKat when we tested it. Geekbench 3 shows a small difference in performance between the Alpha and the Galaxy A7, which hovers close to the Galaxy Note 3. Basemark OS 2.0 proves more sensitive and the difference between A7 and Alpha is quite noticeable. 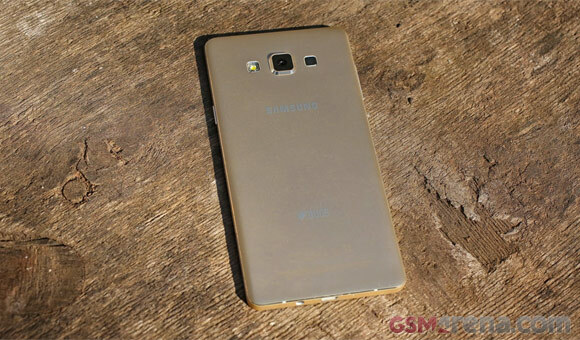 The Galaxy Note 4 is definitely ahead of the Galaxy A7. Full system performance measured by AnTuTu 5 and Basemark OS II 2.0 show the Galaxy A7 has a small advantage over the HTC Desire 820 (another Snapdragon 615 device), but lags behind the flagship Galaxy Note 4. GPU tests reveal what should be pretty clear - Adreno 405 is not cut out for high-end gaming on a 1080p screen. Here the Mali-T628 GPU performs twice as good. Look at the 1080p offscreen tests as the Galaxy Alpha has a 720p screen, while the Galaxy A7 renders at 1080p natively. On the up side, the performance is noticeably improved compared to the Galaxy A5. Basemark X also the Adreno 405 in the Galaxy A7 isn't a gamer's dream. We don't have an Exynos-powered A7 right now, but a peek at scores published by Rightware (maker of the Basemark tests) shows a significant advantage for the Galaxy A7 with Exynos 5430 in graphics. Still, for general browsing the web is generally smooth and fast, BrowserMark 2.1 puts the Galaxy A7 above a good number of powerful flagships though it's not an equal to the Galaxy Note 4. For processor intensive apps either version of the Samsung Galaxy A7 will do fine, however for gaming we'd look for the Exynos model. The web browsing experience is solid. In all three scenarios Galaxy Note 4 performance is out of reach.